A variety notable for its beautiful drooping habit which has made it sought after for lawn and specimen planting. 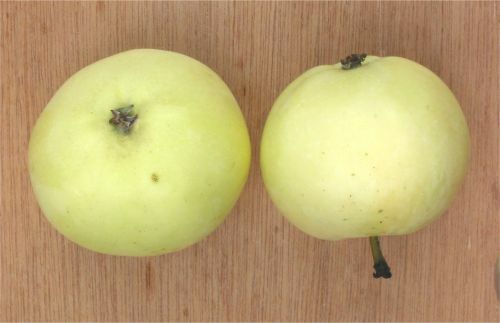 A small bright greenish yellow, golden flushed apple which ripens in September. The rather decorative fruits have sometimes been used for ornamental purposes as late as Christmas. The yellow flesh has a crisply refreshing flavour which used to command a high market value in the Kent and London area, but is seldom seen today. Pollinate with Redsleeves, Falstaff, James Grieve, Jester etc.